Over 50s Car Insurance – Something To Look Forward To? Well, you’ve hit 50 and are probably wondering if anything is going to get better in the years ahead. Your over 50s car insurance premiums are certainly going to be lower. 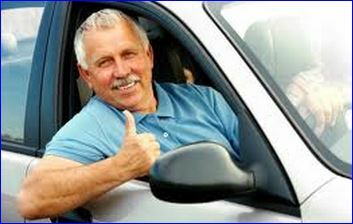 Usually, Car Insurance for over 50s is very cheap. This is due to your experience behind the wheel and more relaxed driving style than your ‘younger’ counterparts. Insurance companies know that you’re less likely to have an accident once you’ve reached this milestone. In fact, car insurance usually continues to come down, providing you stay claim free up until you’re 70-years-old. At this point, it can start rising again, as slower reaction times while driving start to become a factor for many. There are many insurance companies, such as the ones you’ll find on this site that relish insuring older drivers, because there’s less risk involved. That’s why they’ll usually give you an insurance premium far better than any you’ve had before. You can access many over 50s motor insurance policies that are dedicated to your age group. What you shouldn’t do when your over 50s car insurance becomes due for renewal, is accept a quote from your existing insurer and expect them to be loyal to you and offer a good deal. That’s simply not the case. Typically, your existing insurer will give you quite a high premium the second or third time around, banking on you having a “can’t be bothered attitude” to finding alternative insurance. Don’t give them the satisfaction of making more money from you. Take a look at over 50s motor insurance comparison forms, such as the excellent one featured on ‘Very Cheap Car Insurance’ and be prepared to potentially make a massive saving on your next over 50s car insurance policy. Review your annual mileage. One way to do this is to have a look at your MOT certificates and compare one mileage figure against the other. If you have a few of these, you’ll have a better understanding of the sort of mileage you’re doing per year. You might be surprised just how low your annual mileage actually is. Better than comparing the mileage figures on your MOT certificates would be to record your own annual mileage from one point in the year up to the same date the following year. Allow for a bit extra or make adjustments if you expect to have a long distance driving holiday. Fitting certain types of insurance approved security devices can sometimes bring down the car insurance for over 50s, but make sure you check with your insurer or potential insurer to see if it actually makes any difference, at all. Having your car parked in a driveway or secure garage usually brings your insurance premiums down. Often, the above factors can have an amplified effect, especially if you live in a particularly high crime rate area. If you’ve already retired, then obviously you no longer need to add the commuting aspect to your over 50s motor insurance. Be sure to let your existing insurers know or enter it in an online car insurance form. When you’re looking for alternative cover it usually results in a lower price to your over 50s car insurance premiums. Try to avoid paying a monthly premium, particularly if you can afford to pay the full price upfront. Usually, insurers will add a bit extra on top should you go for a monthly plan. Be sure to weigh up the extra cost over the monthly instalments period, when you compare it to the upfront cost. Over 50s Car Insurance – What About Optional Extras? Windscreen Cover – This is a personal choice, really. It can be beneficial, but basically, you have to weigh up the cost against the odds of actually needing to make a claim. Normally, the cost is so low that it’s really not worth omitting. Some over 50s car insurance policies do include this as standard with their comprehensive cover, some do not. Breakdown cover – Again this is personal preference. You could make a saving by not having this, but then again, you could also have are large breakdown recovery bill on your hands in the future. There are many factors that could affect your decision. For instance, how likely is your car to break down? How old is your car, etc? It’s a personal choice and also a gamble as to which will save you the most money. You can of course choose to add breakdown cover whenever you like, so don’t feel that you have to include it with your over 50s motor insurance policy. Do you take your car overseas? If so, you may need to add overseas cover as an optional extra. Check with the insurer, whether this is included in your comprehensive over 50s car insurance policy or whether you need to add it. Legal Assistance – This can be very beneficial, as it will help you to claim back for losses after an accident that wasn’t your fault. Check to see whether your policy has this or if you need to include it as an optional extra. To sum up, if you’re someone that’s actively seeking over 50s car insurance, then weigh up your options and make the most of your significant driving experience to help you decide which level of cover to go for.